The newest and most popular BBQ joint that San Luis Obispo County has to offer is Old SLO BBQ! With authentic Santa Maria style family recipes dating back nearly a century, Old San Luis was voted Best BBQ by New Times in 2016, and is in the running for the 2018 title. With the addition of a pay-per-pour beer wall and multiple new dining areas, expand your beer palette along with the ultimate BBQ for a unique downtown SLO experience! Simplicity at its finest – four sandwich options perfectly paired with homemade BBQ sauce complimented by the sides of your choice. Whether you opt-in to the red oak grilled tri-tip sandwich or are feeling peppery for linguica, there’s an order for that. You can also add their famous tri-tip to a strawberry field salad, topped with Gorgonzola cheese, candied pecans, and more. If you’re as obsessed as we are, request the Best BBQ of SLO County to cater your next event! 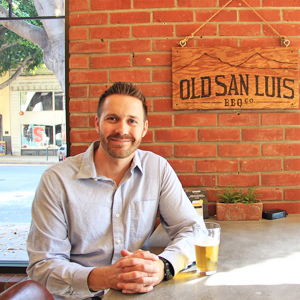 Staying on top of what’s trending in the beverage industry, Old San Luis added a beer wall to its joint in 2017. With 38 different beers, there is ample opportunity to venture out of your pilsner zone and try something new. Pay-per-ounce makes this venture even easier –and cheaper- if it’s not quite your style. Many featured beers are local – SLO Brew, Firestone, and Naughty Oak to name a few, while also featuring some out-of-staters like Deschutes, Goose Island, and Maine Beer Company. Food and beer may make you happy, but the ambiance says it all. The desire for delicious BBQ is fed fast with quick-service, whether you order at the cashier, or at the walk-up window. Their location on Higuera offers indoor and outdoor seating for our beautiful Central Coast days. Similarly, their proximity to downtown SLO allows for a full adventure to surround the eating experience! Cal Poly graduate Matt Pearce remains community focused, offering fundraising opportunities and special events. Through a partnership with SLO Safe Ride, Old SLO BBQ has shown their devotion to keeping their satisfied customers safe as well, with discounts applied for those who use the SLO Safe Ride app that night. Danae Pearce is also a local wedding planner who utilizes the delicious catering of Old San Luis BBQ to complete many of her orders, which embodies the teamwork and unity that the restaurant embodies. Go old SLO!